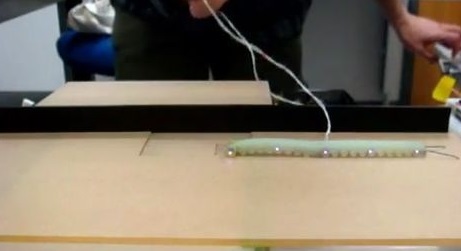 Researchers from Tufts University (USA, Massachusetts) has developed a new model of the robot caterpillar from a soft material, based on the study of wave-like motion, used by many caterpillars. The robot combines the ability to simulate the movement of caterpillars and their own morphology. Along the body of a robot built five infrared sensors which are given the opportunity to follow its movements. Developers have used 3D-control system of speed in the implementation of the project. Robot’s silicone body can quickly take the form of letters «Q» in front of his “escape” and spend it not more than 100 milliseconds. Creating GoQBot is another step towards creating robots of the future. Robot which have 10 centimetres long, thin and elongated body, capable of collapse, can be be useful in the future to perform tasks to rescue people, research buildings and the environment.